Danny is Head of Chambers and Chairman of the board of Edmund Barton Chambers. He is a mediator and is experienced in alternate dispute resolution. 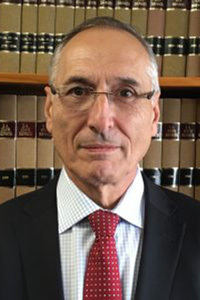 He has served as a NSW Bar Association approved arbitrator for the District and Supreme Courts. He is a leading senior counsel specialising in construction and infrastructure and insurance law. He has been recommended in Doyles as a Leading Construction & Infrastructure Senior Counsel. Danny has been in continuous practice at the NSW bar since the date of his admission. Over that time, he has practised in a wide variety of fields and jurisdictions, including common law, equity and appellate work. He has appeared in coronial inquests and in ICAC. His practice for many years has focused more extensively in the areas of commercial law, general insurance law and construction law. He has appeared in the High Court, the Supreme Court, the Court of Appeal, the District Court, the Federal Court and the Full Court of the Family Court. He has appeared in the Supreme Courts of Victoria, Queensland and the ACT. He has been briefed in a large number of insurance disputes arising out of engineering and construction projects, including Walker Group v Douglas Group (professional negligence claim against geotechnical engineers involved in the construction of the Toll Container Terminal in Newcastle), Drummoyne RSL v Richmond & Ross (professional negligence claim against structural engineers involved in construction of Drummoyne RSL Memorial Club), Baulderstone Hornibrook v Connell Wagner (professional negligence claim against engineers involved in the design of the third runway), Downer v Aurecon (professional negligence claim against engineers involved in the design of waste recycling plant in Queensland), Baseline Constructions v HSB Engineering Insurance (claim for indemnity under construction insurance arising from excavation collapse) and Gillespies Cranes v QBE Insurance (claim for damages arising from collapse of crane at construction site). He has acted for and advised a number of insurers, including Zurich, Vero, QBE, Chubb and various London insurers. He has acted for Westfield in relation to many public liability claims. He regularly advises insurers on all aspects of liability, policy interpretation and recovery and has acted for insurers in recovery actions. He has acted for and advised the Nominal Defendant and the Default Insurance Fund in the ACT in relation to the defence of various claims and recovery actions in the ACT Supreme Court. Danny has also practised extensively in the area of commercial law and has advised and appeared in numerous matters involving contractual disputes, partnership disputes, corporate disputes, commercial leases, options, misleading and deceptive conduct and commercial fraud. He has appeared in insolvency disputes in both the Federal Court and the Family Court in recent years. Included among his recent cases are Allied Express Transport v Exalt Group (Federal Court 2013) and Bridge Property Investments v Garland (Court of Appeal 2014). He recently appeared in ICAC in the investigation into Australian Water Holdings on behalf of a number of aggrieved convertible note holders. Danny has also been briefed in a large number of construction disputes in the Supreme Court and in references and arbitrations. He has represented both contractors and proprietors in contractual disputes arising from the construction of commercial buildings, domestic dwellings and infrastructure. By way of example he has appeared for Club Marconi in long running litigation arising from major extension work undertaken by the builder, for Ipoh Gardens in relation to a claim by the excavator arising from the World Square project, for Concrete Constructions in relation to a claim by its sub-contractor arising from the construction of the Oceanic Hotel in Coogee, for Crown Gardens in relation to a claim by Fletcher Constructions arising from the construction of the Crown Gardens development, for Concrete Constructions and the State of NSW in relation to a claim arising from the development of the Conservatorium and for Meriton in relation to various construction claims and disputes. He has also been briefed in various matters involving the Security of Payment Act and successfully represented the claimant sub-contractors in two significant cases, namely, Coordinated Construction v Climatech and Coordinated Construction v Hargreaves which travelled to the High Court. Danny has considerable experience in mediations involving complex disputes in the fields of construction and engineering law, commercial law and general insurance. He has acted as a mediator and has appeared in mediations conducted by leading mediators such as Sir Laurence Street AC, KCMG, QC, John Clarke QC, Tony Fitzgerald QC, Trevor Morling QC, Michael McHugh QC, Ian Callinan QC and Stephen Walsh QC. He is an active member of the Bar Association’s “Mediator Chat” seminar group and has contributed to the debates conducted by that group. He is also a long term and active member of the Construction Law Discussion Group. Over the years, Danny has provided and chaired seminars in the fields of insurance law, construction law and practice and procedure on a regular basis. He has from time to time been invited to provide seminars at firms such as Mallesons and Norton Rose Fulbright. Danny has served on the Bar Association’s Professional Conduct Committee and the Common Law Committee.